It's been a mental priority for me to get Penelope into swim lessons for quite some time now. 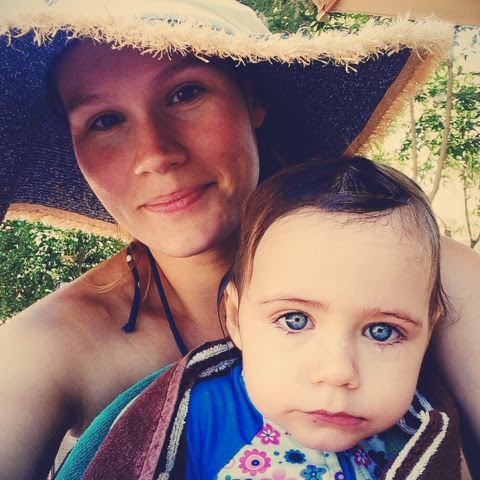 Surprisingly, we swam very little last Summer, and then Fall came and went... and before I knew it, I had an almost-two-year-old and this swim season was upon us. Here in the "Valley of the Sun" there have already been 24 drownings this year alone (source). It's not even July yet. 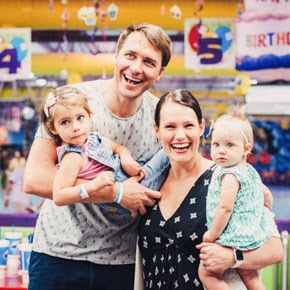 And if you know my family well or read my sister-in-law's blog, you probably know that we had a serious scare with my nephew Huxton two years ago right here in our community pool. That day at the pool and the emergency Cesarean birth of my child have been the two most frightening days of my life. Swim lessons. I needed to get on it. No excuses. This is a no joke deal. I did some research on local swim schools and private teachers, different philosophies -- fear-based and fun-based alike -- and came upon one particular in-home teacher that came highly recommended by two of my Mommy-friends. She sent me the details. The next session would begin on June 10th and would be half an hour, three days per week, for four weeks. THREE DAYS A WEEK?!? For a month???! That would CONSUME our schedule. Ain't nobody got time for that, I thought. Then I read on in her email about the importance of repetition and routine for pool safety and swim basics. It made sense, and she's taught more kids to swim than I have, so I bought in. We would do it. I would commit to packing up the towels, putting on sunscreen and a swim diaper, grabbing my big floppy sun hat and my big pregnant belly, and driving to this lady's house -- every morning, three days a week, for four weeks in a row. In the name of safety. I expected the first day to be tough. I knew this wasn't going to be the type of swim lessons I remembered from when I was a kid... mom in the water with baby singing "loop de loop, loop de lye" and blowing bubbles. Although not as traumatic as ISR (which I decided a while back just wasn't for us), I'd been warned that her style would be a little bit more "aggressive" than the typical swim school instructor. Truthfully, that was what I wanted. In my researching, I felt like we were past the age of blowing bubbles and singing songs -- if water safety was to actually be the goal. Nevertheless, Penny probably wasn't going to like it... and it was probably going to be hard for me to watch. Penny basically screamed in agony the entire half hour. I wanted to cry too, every time she pointed at me from the water desperately "Mommy!" between sobs... but I forgot my sunglasses that day and didn't want to be that mom. I liked the teacher a lot. She was positive but firm. She didn't waste any time and she knew what she was doing. She assured me that this sort of first day was totally normal. Others also assured me that it would get better quickly. All I could do was believe them. relieved to be out of the water and in my lap, but not willing to smile. I was mentally prepared for the drama from day one. At teacher's suggestion, I sat on the steps this time to be a slight comfort for Penny -- and to prevent her from climbing out of the pool by herself when it wasn't her turn. Still lots of tears and anxiety and fingernails digging into poor teacher's neck and arms. But, at the end, she didn't cling to me like a leach as I wrapped her in her towel, and she was just fine by the time we got back in the car. uneasily anticipating the beginning of her class time. Something miraculous happened. Penny didn't cry. Penny willingly went to the teacher in the water for her drills. Penny held her breath. Penny nodded "yeah" when asked if she wanted to go one more time. Penny got home and told Daddy about her big arms and closing her mouth under the water and being a monkey going back to the steps. After just one week, Penny was no longer afraid of entering the water face-first, and had learned how to come up to the top and grab the side of the pool and make her way back to the steps. I could not believe it. I was expecting weeks of drama and agony, but she turned a corner in three days. Of course I'm not saying she's a "swimmer" or that she's "all set" for pool safety... but I walked away from lessons this day confident in my decision to do this, as I held hands with my happy and confident little fishy. This progress would not be happening if we weren't committing so much of our time to this. So, despite the burden of having wet towels all over the house and the smell of sunscreen lingering in my car, I am pressing on. Our mornings revolve around eating a good breakfast and getting ready for swimming; and our afternoons revolve around showering off the chlorine, hydrating our skin, and -- thankfully -- taking really good naps because we are so tired. And on the days she doesn't have lessons, I'm going to pack up our stuff and get our butts to the pool as often as possible. Repetition and routine. There is no other way to do this. And this is important. 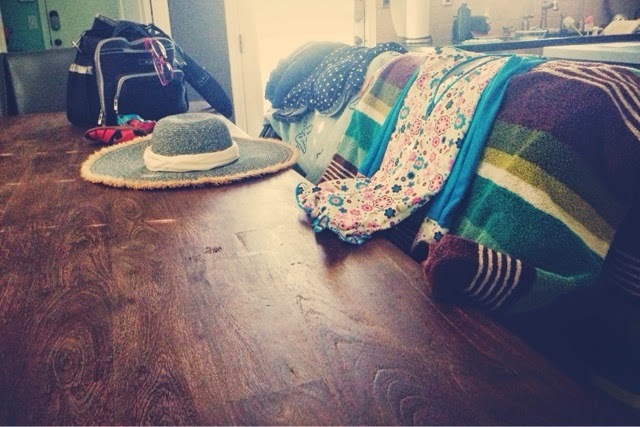 our swim stuff lives on our kitchen chairs, drying and ready to go for the next day. I cannot wait to see what Penny is capable of in the water at the end of four weeks.